I've learned through the BrainSMART program that one of the most powerful tools you can give your students is thinking skills. When you or I read (or do math, science, and even everyday life situations), we automatically make predictions, inferences, questions, schema, etc to help us understand and make decisions. Most of us weren’t explicitly taught these skills…we simply figured them out over time. Just imagine the advantage we would have had if we learned these skills early in life! Thinking skills are remarkably easy to teach and learn. My second graders can prove it! We created a video discussing and demonstrating their favorite thinking skills. If second graders can do it…all grades can (and should) do it! Keep in mind that everything they say is in their own words. "My daughter assigned the family reading groups this evening. She is putting your lessons into practice at home. :)"
Mom also sent along this picture of her daughter with a poster the daughter made for her family. Notice the thinking skills she wrote on her poster. What a great student! 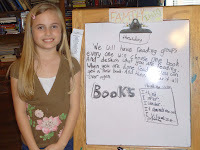 She has internalized the thinking skills and can teach them to others. In our next video we will demonstrate how we learned each skill. Stay tuned, and remember...if second graders can learn and use these skills, so can upper grades!